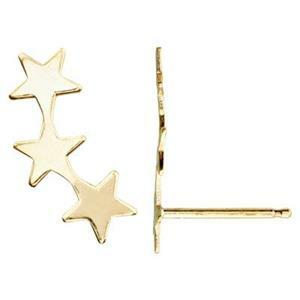 14/20 Gold Filled 4x14mm 21 gauge 3 Star Climber Post Earrings, .7mm Post Thickness. Clutches Not Included. Order 2pcs to get one pair of earrings. Climbers are super hot! Instead of letting these arched designs dangle below the lobe, you twist them so the motif travels up the ear. Climbers stand out! These gold filled tiny stars are a great upsell to go with your larger statement earrings.